Who could resist saying “Oh my glob” to such an adventurous tin tote gift set? Not Bif Bang Pow!. 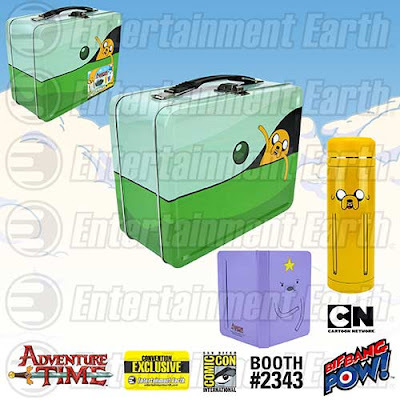 That’s why we created this totally mathematical Adventure Time Traveling Jake Tin Tote Gift Set – Convention Exclusive. This colorful one-of-a-kind tin tote looks just like Finn’s backpack with Jake traveling inside and measures approximately 8 5/8-inches wide x 6 3/4-inches tall x 4-inches deep. Inside you’ll find a 7 1/4-inch tall, 300 ml insulated stainless steel container featuring Finn’s best friend Jake; and a 5 1/2-inch tall x 3 1/2-inch wide hardbound mini-journal of the Lumpy Space Princess that boasts 192 lined pages, an elastic closure and a built-in bookmark. Ages 14 and up. This is a special limited edition set of only 1,500 pieces so you’ll want to try and get your hands on one before it travels away forever! Available for the first time on July 8, 2015 at the Entertainment Earth booth #2343 at San Diego Comic-Con, fans will have the first opportunity to grab this individually numbered and limited edition exclusive. Not attending San Diego Comic-Con 2015? *PRE-ORDER your Adventure Time Traveling Jake Tin Tote Gift Set - Convention Exclusive at Entertainment Earth now! See more of our mathematical Adventure Time collectibles here! Your office deserves a hero and Entertainment Earth decided that justice should be served. We’ve got a never-before been seen product that will brighten up even the darkest of caves, and it’s set to make its debut very soon! While we still need to protect our new product’s secret identity, we can tell you that our official announcement is so exciting, you’re going to want to be sitting down for it! Make sure to stay tuned to Entertainment Earth News and all of our social media networks for all the latest breaking developments! In the meantime, check out all of our latest collectibles at EntertainmentEarth.com. Space might be the final frontier, but the sea is still just as fascinating. Now you’ll be able to bobble with some beauties of the deep blue sea thanks to the Star Trek IV: Whales with Spock Bobble Head – Convention Exclusive from Bif Bang Pow!. 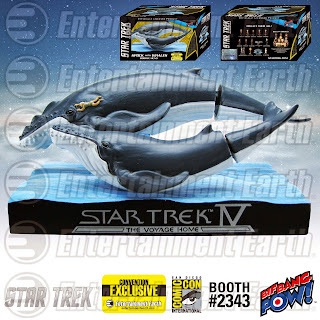 The exceptionally detailed collectible features a miniature-sized Spock swimming with two humpback whales as depicted in the motion picture, Star Trek IV: The Voyage Home. Unlike other bobble heads, the unique aspect of this collectible is the fact the tail of each whale bobbles instead of the head. And, making it a true collectible, the run will be limited to just 1,998 convention-exclusive pieces, each individually numbered. Not attending San Diego Comic-Con 2015? *PRE-ORDER your Star Trek IV: Whales with Spock Bobble Head – Convention Exclusive at Entertainment Earth now! 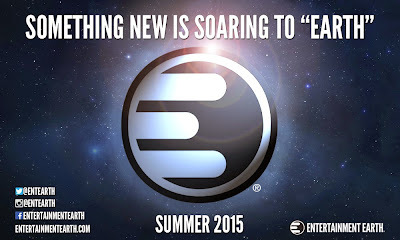 Stay tuned to Entertainment Earth News and all of our social media networks for the latest SDCC reveal news. 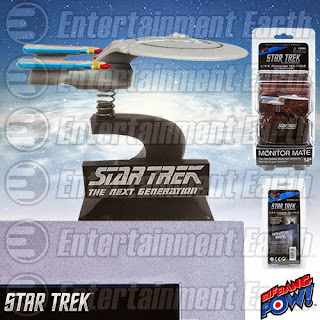 See more of our intergalactic Star Trek collectibles here! While we still can’t reveal the details of our master product plan, we will leave you with a hint that our new product has the power to make you a hero on a daily basis! Why just listen to the news when you get to play with it? That’s what Bif Bang Pow! 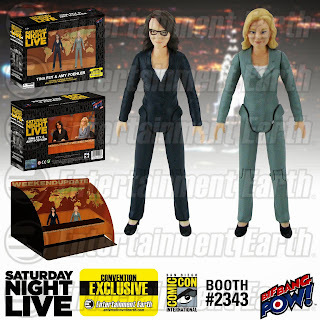 had in mind when they created the Saturday Night Live Weekend Update with Amy Poehler and Tina Fey 3 1/2-Inch Action Figures Set of 2. Showcasing the detailed likenesses of both Tina Fey and Amy Poehler, this 3 1/2-inch set of figures showcases the leading ladies of laughter in their professional news anchor attire. The two SNL alumni come ready to deliver the news with the included fold-out diorama of the iconic “Weekend Update” news desk. This Entertainment Earth Convention Exclusive is limited to just 2,400 sets. Available for the first time on July 8, 2015 at the Entertainment Earth Booth #2343 at San Diego Comic-Con, Fans will have the first opportunity to grab this individually numbered and limited edition exclusive set before it disappears from the headlines for good! Not attending San Diego Comic-Con 2015? *PRE-ORDER your Saturday Night Live Weekend Update Amy Poehler / Tina Fey 3 1/2-Inch Action Figures Set of 2 at Entertainment Earth now! See more of our hilarious Saturday Night Live collectibles here! The Dude is back and we take comfort in that. From Bif Bang Pow! 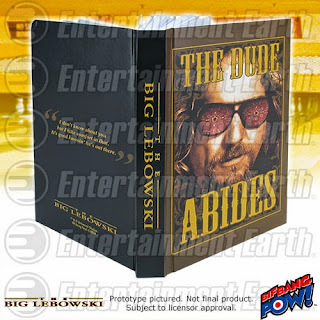 comes two all new journals inspired by The Big Lebowski and The Dude himself. Available for pre-order now, you finally have a place to write down all your crazy dreams and acid flashbacks. The Big Lebowski The Dude Abides Journal has The Dude himself chilling out in his sunglasses with his iconic motto, “The Dude Abides” printed on the front. The back features the classic quote, “I don't know about you but I take comfort in that. 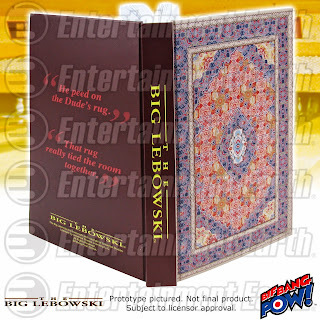 It's good knowing he's out there.” Also available is The Big Lebowski Rug Journal, which of course showcases the rug on the front! 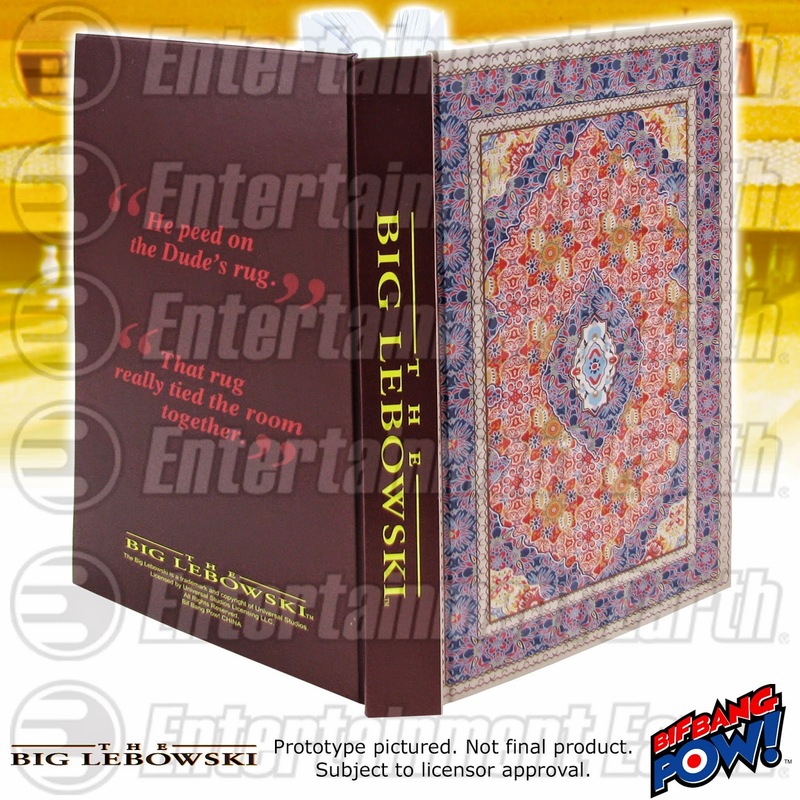 The back has two quotes, “He peed on the Dude’s rug” and “That rug really tied the room together.” Each hardcover journal has incredible 4-color artwork, measures approximately 8-inches tall x 5-inches wide, contains 320 lined white pages and displays The Big Lebowski title logo on the spine. Ages 18 and up. Be the Savior of the Universe at your next party with these distinctive 16 oz. glasses from Bif Bang Pow!. 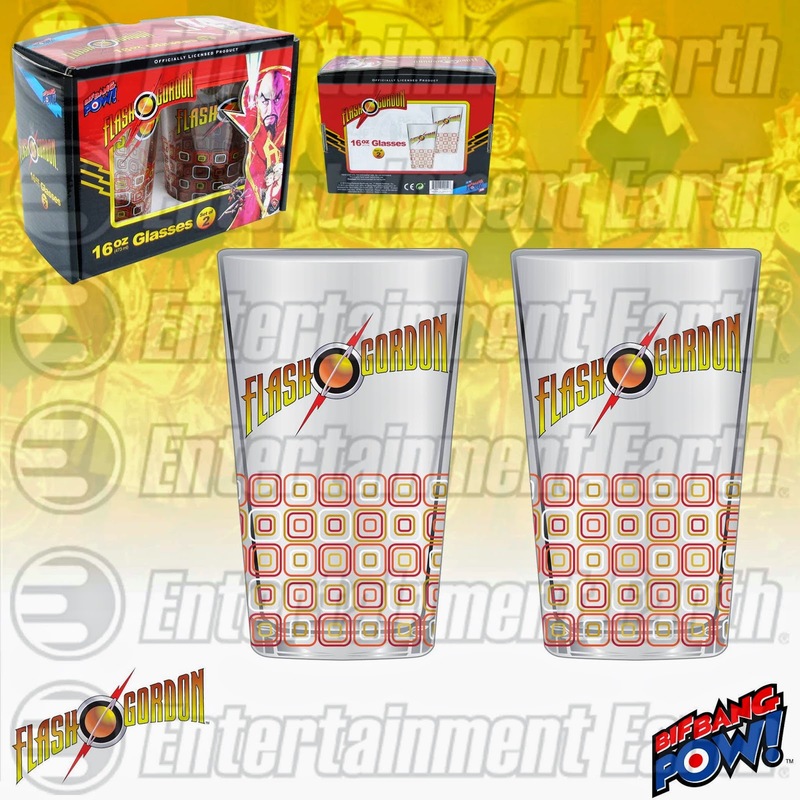 These collectible pieces of glassware come 2 per set and each display the Flash Gordon logo in magnificent full-color artwork. Here’s your chance to raise your glass – literally – to the legendary hero. Now in stock at Entertainment Earth! Ages 14 and up. As the loveable serial killer would say, “Tonight's the night.” Although more appropriately, today is the day Bif Bang Pow!’s Dexter Morgan 8-inch action figure is in-stock at Entertainment Earth! This bloody awesome 8-inch Mego-style figure captures the likeness of the Miami Police Department’s Blood splatter expert, Dexter Morgan, from the uber-popular ShowTime TV series Dexter. The figure comes complete with a full fabric outfit as inspired from Dexter’s wardrobe on the series and includes a knife accessory as well. This unique one-of-a-kind action figure features multiple points of articulation and come packaged on a full color blister card. 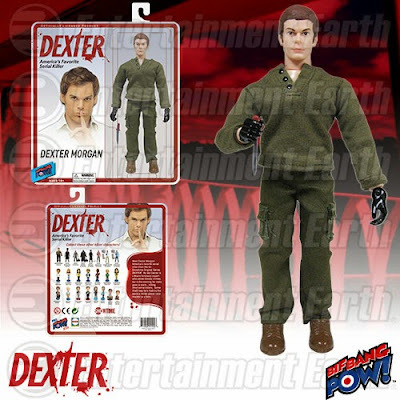 Don’t be one of the many fans to scream bloody murder when this figure sells out, so grab your 8-inch Dexter action figure today! Check out all of our killer Dexter collectibles here! 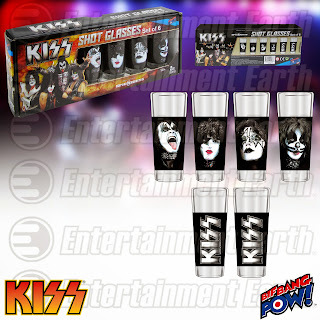 Rock and Roll All Nite & "Drive" Every Day with KISS! KISS drives us wild and now Bif Bang Pow! 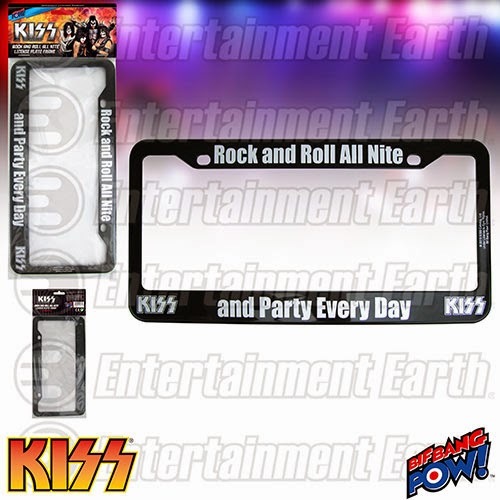 will drive you crazy for our new KISS Rock and Roll All Nite and Party Every Day License Plate Frame! Now fans can display their love of the outrageous hard rock band as they drive all night and day. Now in stock at Entertainment Earth! This bold black plastic frame rocks the band’s famous lyrics “Rock and Roll All Nite” at the top of the frame and finishes up the sentence with “and Party Every Day” on the bottom of the frame in metallic silver lettering. 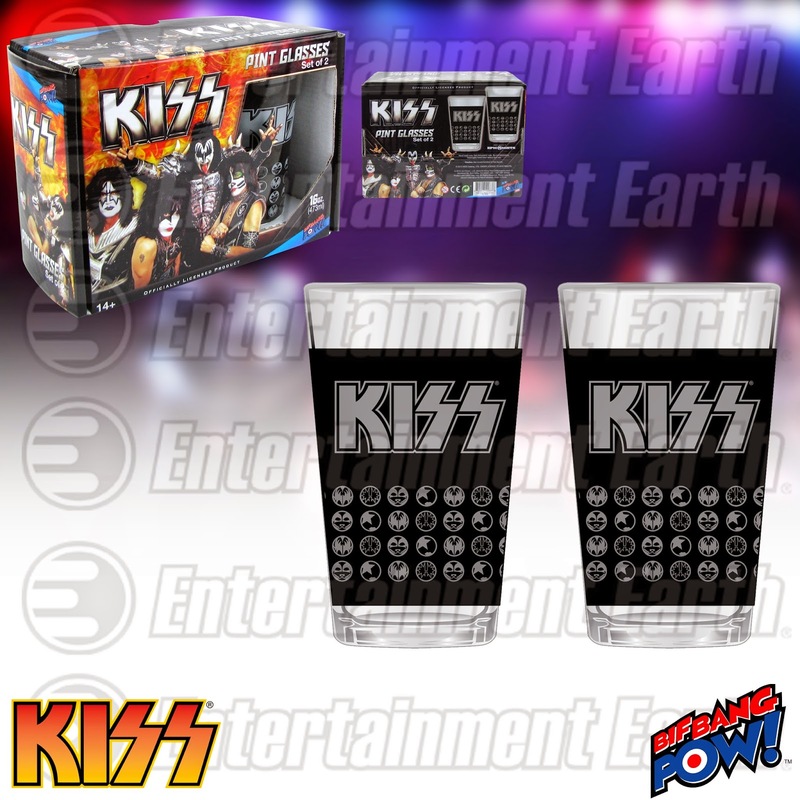 Each plastic frame measures approximately 12 1/4-inches wide by 6 1/4-inches tall and prominently displays the official KISS logo in each of the bottom corners. 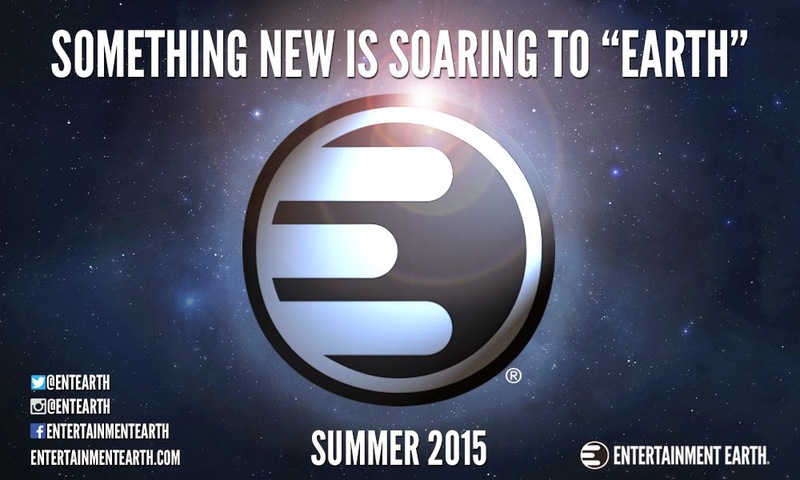 While we can’t disclose the full details of our top secret first-of-its-kind product just yet, we will slowly be providing some additional teasers as the big reveal gets closer. In the meantime, check out all of the latest in pop-culture collectibles at EntertainmentEarth.com. 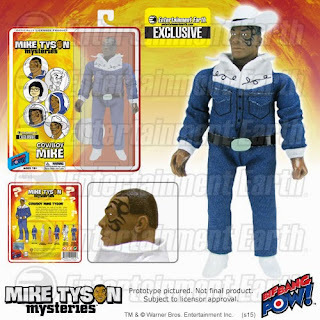 Get ready to saddle up with the Former Heavyweight Champ of the World with our new Mike Tyson Mysteries Mike Tyson Cowboy 8-Inch Action Figure! This Entertainment Earth Exclusive 8-inch figure features Mike in a classic western style fabric shirt and pants combo along with white boots and a removable white cowboy hat all done in the style of the popular Mego figures of the 70’s and 80’s. Even the champ’s head sculpt showcases his signature face tattoo. At only 1968 pieces available, collectors will want to grab this limited edition and individually numbered mystery-solver before it rides off into the sunset. Available for pre-order now at Entertainment Earth.com!